I think the city with most nicknames in Indonesia is Ambon. Island of Spices, a nickname that I always read and heard during my high school time, precisely on history subject where long time ago Moluccas Island/Ambon produced spices, also as trading market. Another nickname is Sweet Ambonese, literally they are all sweet. Ambonese are very nice and helpful. “Ambon the city of music”, totally agree. Ambonese are very talented. They have amazing voices and high musicality. Even the local government supports the music events in Ambon. Lovely people and beautiful city landscape made me fell in love with Ambon. I almost left by my plane due to unclear announcement in Makassar airport. The voice of the speaker was so small until I couldn’t hear the announcement clearly. Moreover they opened the same gate for same airline, in the same boarding time but different destination. Something doesn’t feel right, my sense worked at that time. I asked then officer and yep, the plane was about to take off and I was the almost left one. What only matter was I didn’t miss the flight. I chose to sit near the window because I knew the view will be amazing. The plane flew to the south across Takabonerate archipelago, consists of atoll type islands and they really look like a painting on canvas. Once I arrived at the airport, my couchsurfing host picked me up with his motorbike. It’s the first time I saw a city in Indonesia using ferry as the transportation connecting different side of the city. Ambon city shaped like horseshoe that’s why it’s closer to take boat from one side to another side crossing the sea rather than overland. I stayed in Amans Inn for Rp 220,000/night. The hostel is strategic, near the market, harbor, and also bus station. Located in the central of the city, world peace gong is a symbol to commemorate SARA riot happened in Ambon in 1996-2002. There are several world peace gong in the world including the gong in Bali, China, Swiss, Hungary, etc. There’s a small museum under the gong with some photo displays. Entrance fee to the gong and museum is Rp 5,000. The gong looks prettier at night. Hunimua Beach or known as Liang Beach, located around 40 kms from Ambon city. A beautiful beach and also relaxing with the awesome water color. Getaway for local people during weekend. Many kids jumping from the bridge into the crystal clear water. I went there during weekend and I saw many families doing picnic at the beach. Go in weekdays if you seek for serenity. Liang Beach can be reached by public bus or angkot to Tulehu. It costs Rp 15,000 one way. Entrance fee to Liang Beach is Rp 2,000/person. Liang Beach is much prettier and cleaner than Natsepa Beach, but Natsepa Beach is closer from the town than Liang. 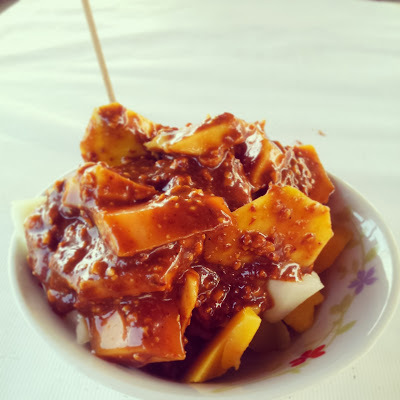 Along the roadside you’ll find the famous Rujak, mixed fruit with peanut sauce. Taste sweet and savory. If you have more time visit Christina Tiahahu Statue, Indonesian heroin from Ambon with the city view by taking angkot to Karpen (Rp 3,000), also Giant Eel in Waii by taking another angkot to Waii (Rp 10,000) and continued by Ojek (Rp 15,000). If you need a place to stay near airport there’s one cheap homestay named Michael’s Homestay but you won’t recognize because no sign board/name on the house. You can call here +6281343028872. He could speak english and also very helpful. The family has three rooms with rate per night Rp 100,000 including breakfast. i hope one day i will go there. lautnya bening banget..jadi pengen nyebur juga.. I was reminded of attractions in Klungkung regency. similar to Ambon City. Ambon memang mantap intuk di kunjungi.